Be it a joyous Valentine’s day celebration, an exciting honeymoon, a momentous anniversary, or a passionate date night. Ah, love and romance is in the air. Most couples would want to revel in their love dearly during such special event. For us, Sweetie and I, we want our special moments to be celebrated in a quiet, scenic, and private place where it feels that we are only the two people in the world. 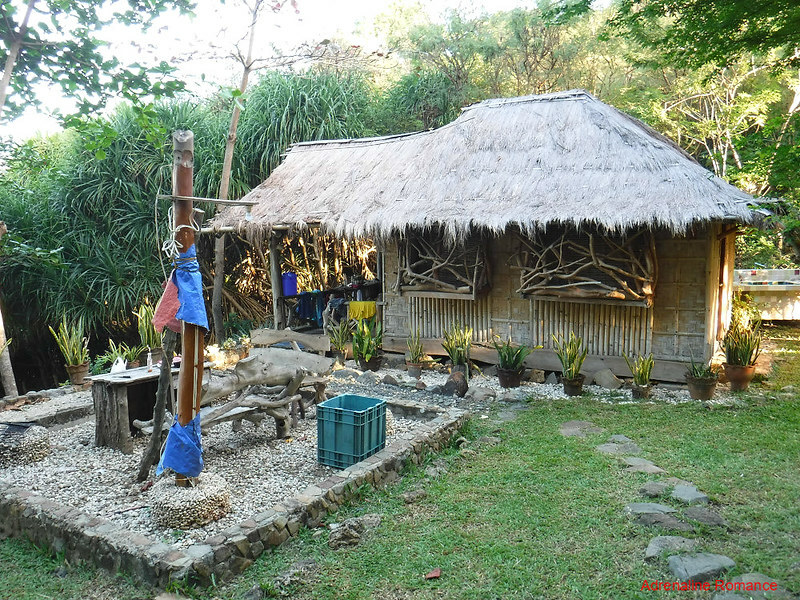 We found such place in Nature’s Eye Resort in the verdant island province of Guimaras. A few months ago, we received an invitation from the resort’s owner and manager to visit the resort after she chanced on our blog. She probably loved the idea of us being a sweet, adventure-loving couple. The gentle sea breeze turned into comfortable, cool gusts as our ship went underway. The cool temperature allowed us to sleep soundly. When we woke up, we were near the port of Iloilo. 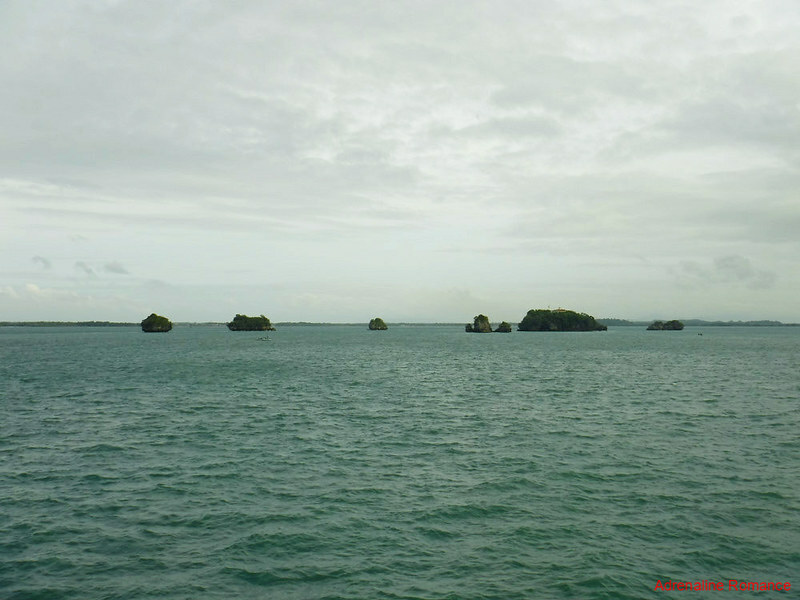 The tiny Siete Pecados islets (Isles of the Seven Sins) seem like immobile guards that stand watch in the narrow passage of Guimaras Strait. 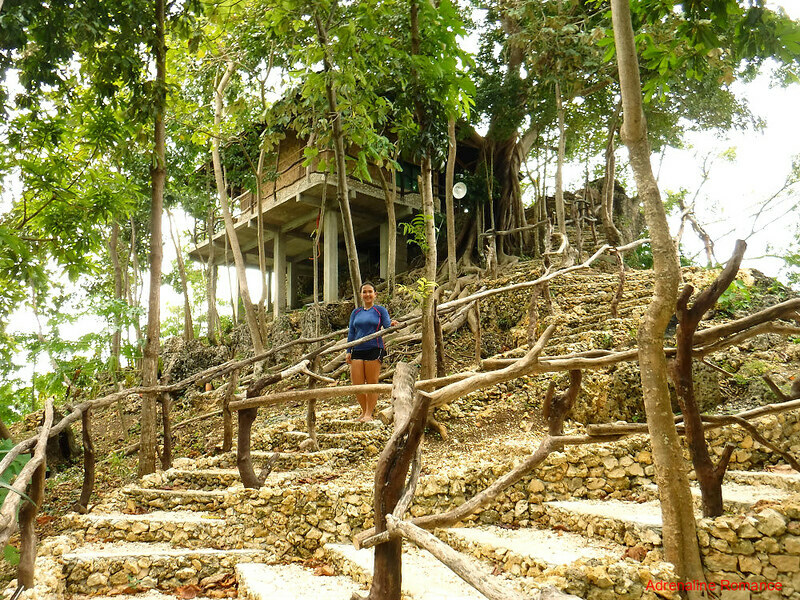 These islands served as convenient lookouts in the past and are still used as such today. Doing simple good deeds to strangers really has its own rewards. We helped an old lady carry her heavy bags off the ship. It was our own way of paying it forward after Good Samaritans took care of us during a potentially unfortunate episode a year earlier. In return, she paid the jeepney fare from Iloilo port to Ortiz Wharf where we took a ferry to Jordan Port in Guimaras. 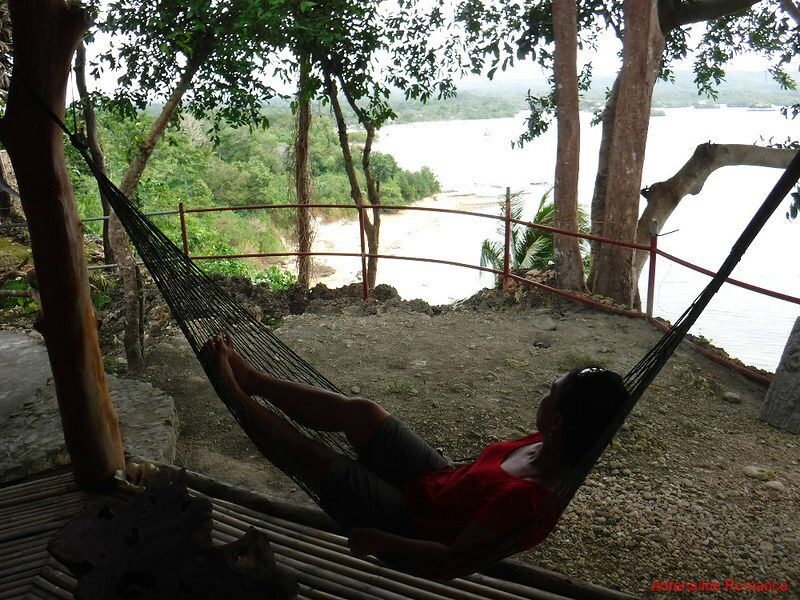 Our host made sure everything was convenient for us by coordinating with Guimaras Tourism Officer Ruby. Having a convenient tourism desk or booth in important points of entry such as ports, airports, and terminals is really a great help to visitors. 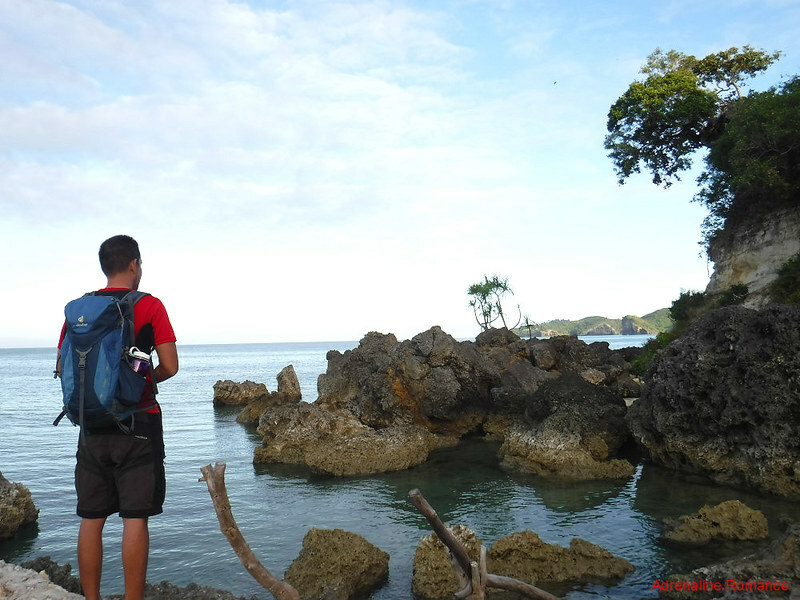 The Guimaras tourism desk provides maps and flyers that indicate attractions, restaurants, accommodations, emergency numbers, and other relevant information that visitors need. After a short welcome briefing, Ruby introduced us to our driver Bongbong who took us to Barangay Tando in the municipality of Nueva Valencia. 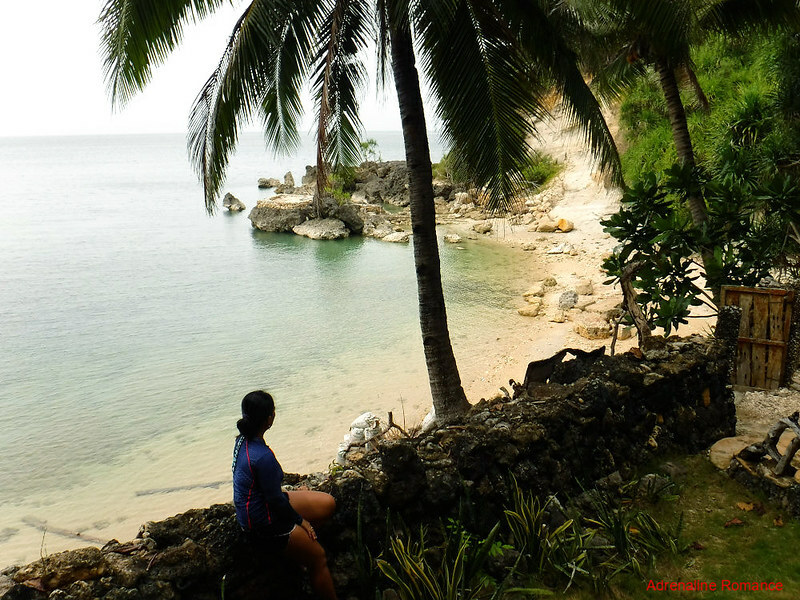 Following a one-hour ride south through the center of Guimaras, we finally reached Barangay Tando, which hugs the southwestern coastline of the island. In a secluded white-sand beach, we boarded a small banca (motorized outrigger boat) to take us to the resort. At first, we thought that the resort is located in another island. 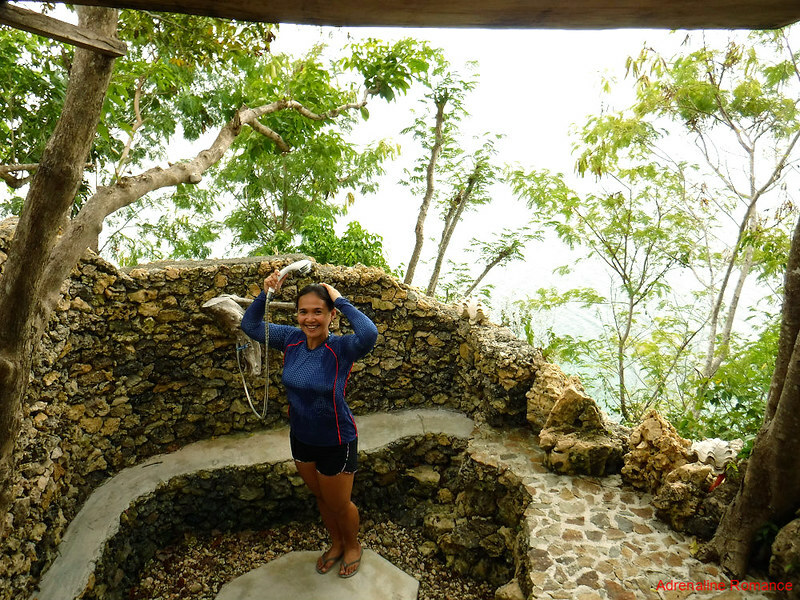 Well, it turned out that it was just a 5-minute boat ride from the beach; we just needed to go around a large and impassable coral-stone cliff that was in the way between the beach and the resort. That means, Nature’s Eye Resort is totally secluded, which is perfect for couples who want nothing but peace, quiet, and their very own companionship. It was immediately evident that Nature’s Eye Resort truly lives with its namesake. The entire facility is shrouded in a lofty forest. 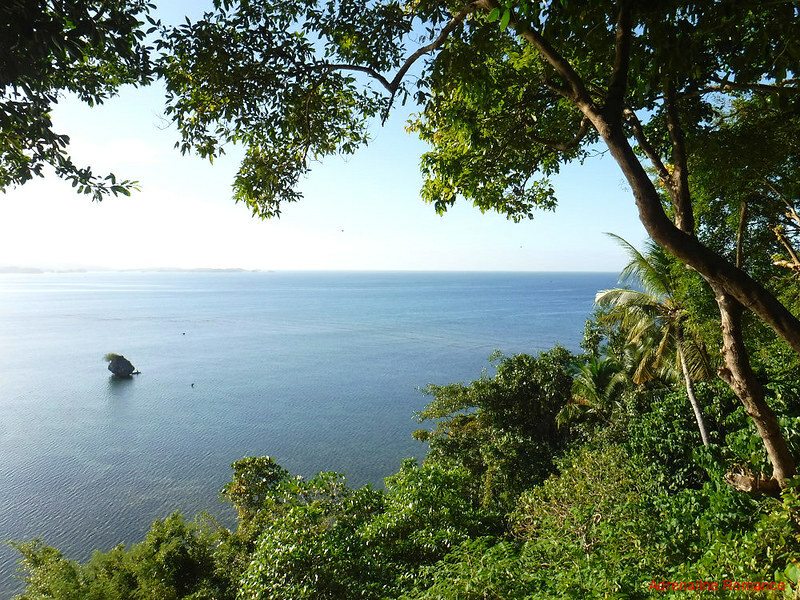 Furthermore, the accommodations are positioned facing the seascape of Panay Gulf. Concrete-and-gravel steps lead from the beach to the reception area high above the cliff. If you think you and your sweetie needs a bit of exercise to loosen those love handles, then climbing these steps is for you! Don’t worry about the heat because the large-canopied trees provide a whole lot of shade to protect you from the sun’s heat. 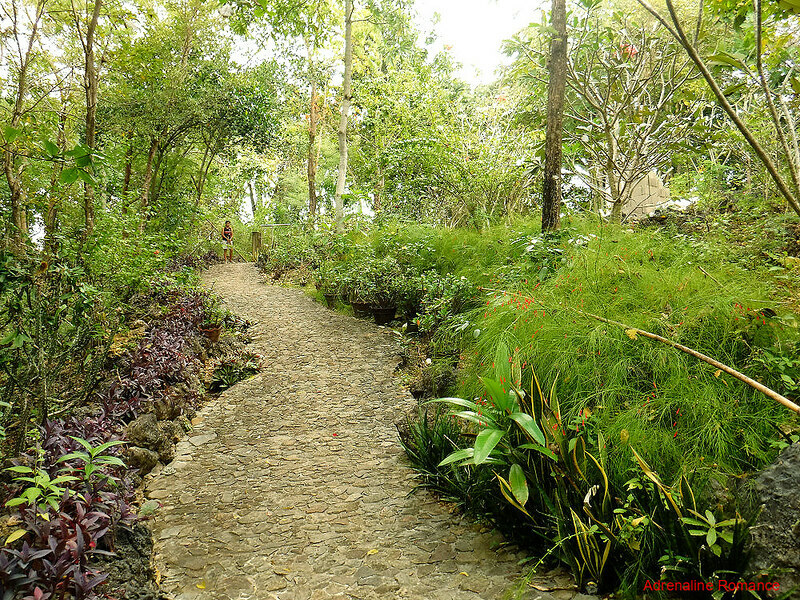 Walking along the resort’s lovely, manicured garden truly rekindles one’s romantic feelings for each other. The beauty of the lush garden actually intensifies the feeling of togetherness. Multi-colored flowers, graceful palms, and lush bushes together with undulated coral rock formations all create an all-natural, beautiful setting that radiates enchantment. Look at all those colorful blossoms! Don’t you just want to pick one up and place it behind your partner’s hair? 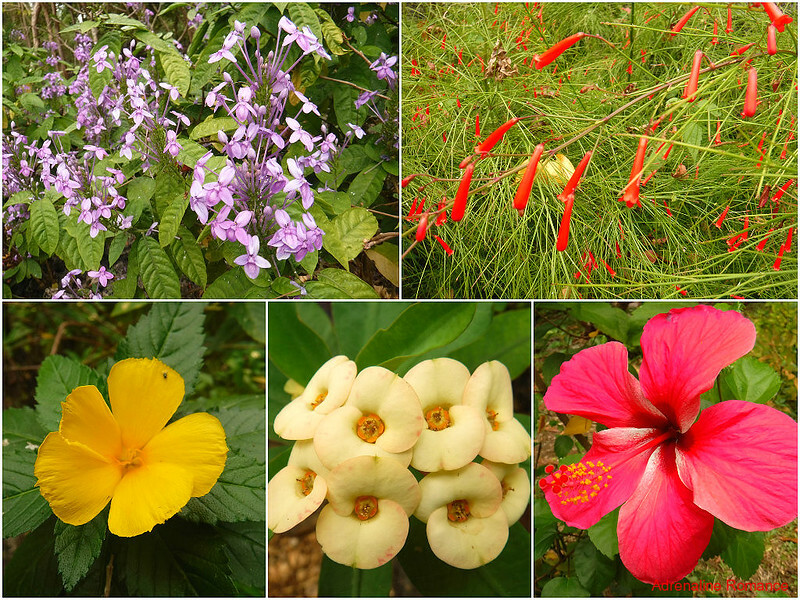 The resort’s garden beats out any commercial bouquet. 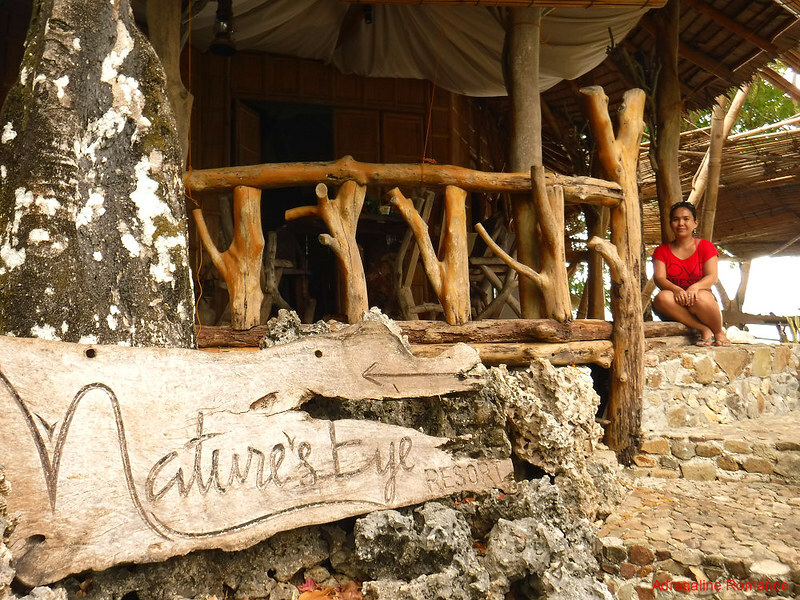 Far from the commercialized frenzy, chaos, and business-like ambiance that often characterize the usual hotels and resorts, Nature’s Eye Resort makes couples feel that they have the entire place for themselves. During our weekend visit, there were only a very few workers—no more than a dozen—quietly frolicking, cleaning, and doing their work at various points in the area. The whisper of the wind, the rustle of the leaves, and the soft tweet of seabirds serenade you with a sweet sonata of Mother Nature. 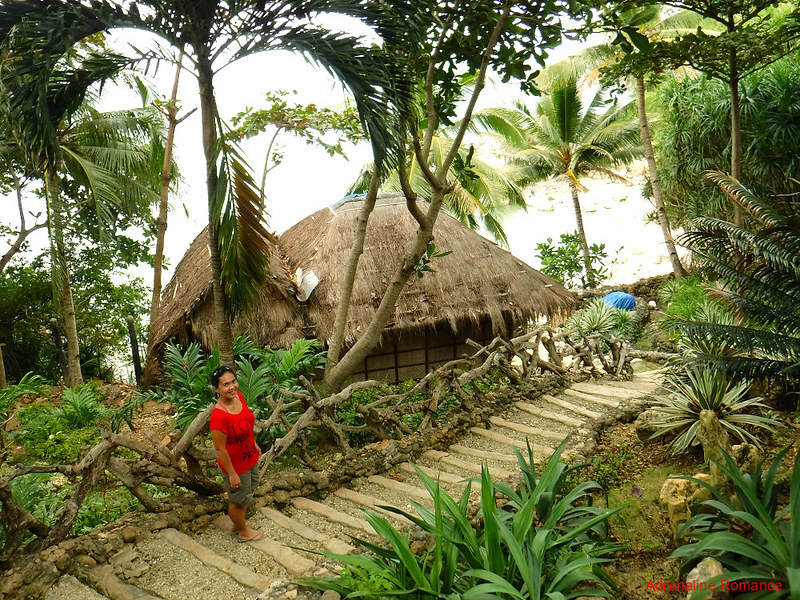 At the end of the concrete-and-gravel steps is the Nature’s Eye Resort’s navel, a multi-purpose structure made of bamboo, wood, and nipa structure. Very Filipino in architecture, it serves as a reception area, a lounge, a kitchen, and a restaurant. More importantly, it is also the humble home of our kind host. While waiting for lunch, Sweetie relaxed on one of the hammocks that are tied around the reception area’s posts. Here, it is so easy to forget about the world and simply live in the moment. Lunch bell! It was time to fill our tummies; they have been rumbling for quite some time since we only had coffee, crackers, and a few pieces of chicharon (pork rinds) for breakfast. We were delighted when the resort’s chef, a simple and motherly woman, prepared a home-cooked lunch of delectable squid and hot sinigang na isda (fresh fish boiled in a broth soured by tamarind). 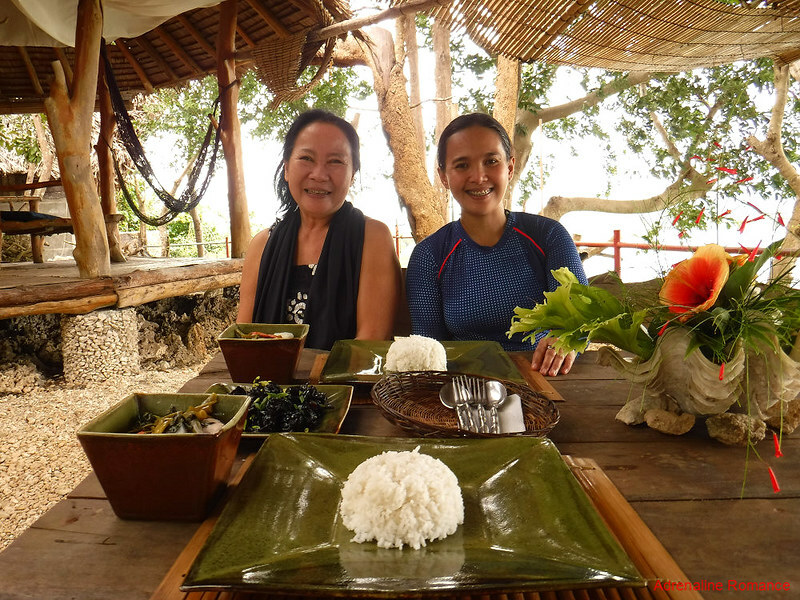 The gentle and soft-spoken resort owner, Rowena Amancio, joined us for lunch. She has lived and worked in Switzerland for more than 20 years before she decided to come back home for good and put up her own hospitality business. A self-confessed romantic, Ma’am Rowena established Nature’s Eye Resort as a venue for sweethearts, honeymooners, and married couples. 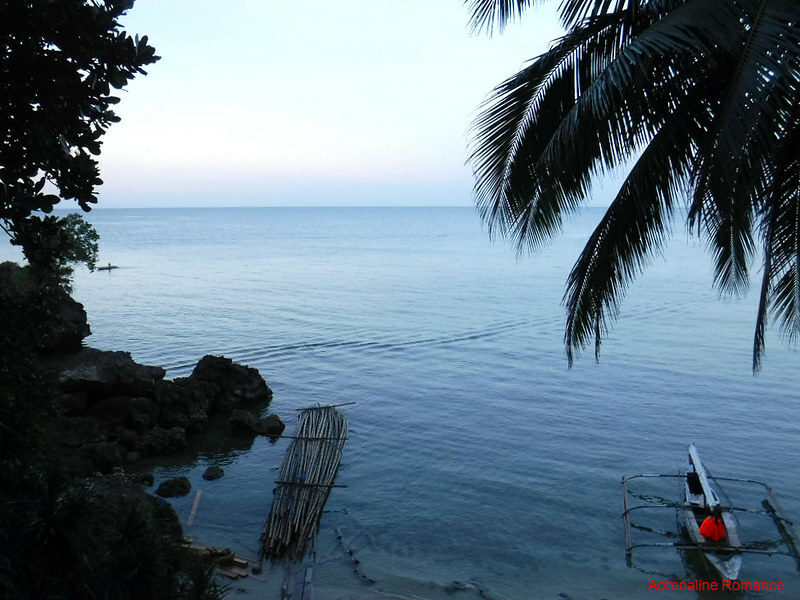 We learned that it was really her intention to set up the resort in a beautiful but secluded, difficult-to-access area in Guimaras so that couples can truly experience love and romance in utmost privacy. We quietly enjoyed a delicious meal while looking over at the scenic bay below us. We were told that after lunch, we’re going to check out the small islets and outcroppings that occupy the bay. You definitely won’t be surprised if we tell you how excited we were. 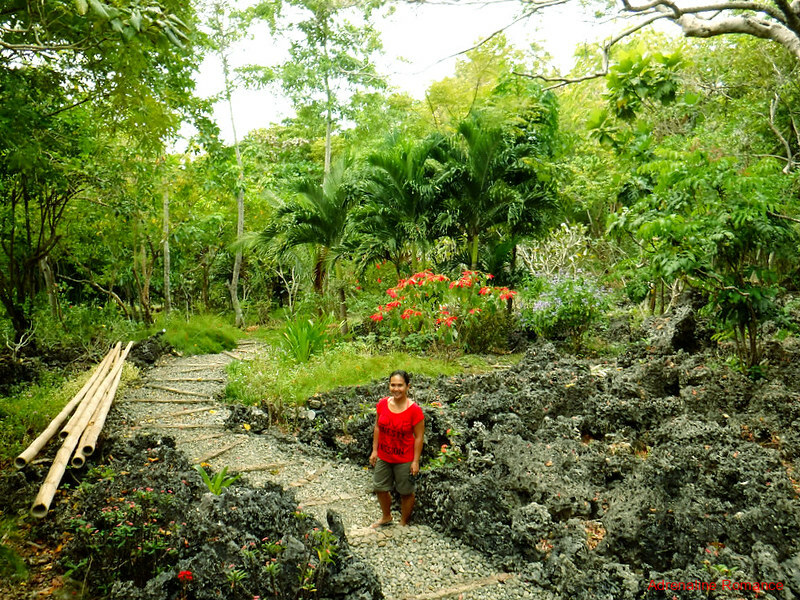 Ma’am Rowena explained that among the things that inexorably drew her towards the tip of Barangay Tando were the striking rock formations that surround the area. Indeed, those outcroppings look amazing! 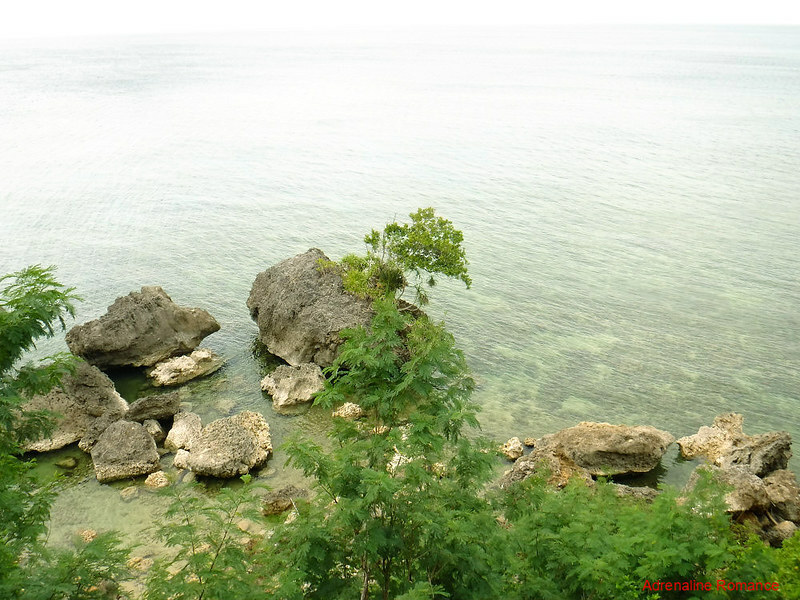 Surrounding those rocks are patches of sea grass and corals, which we can clearly see under the clear water. Like us, she believes that Mother Nature is already exceptionally beautiful. 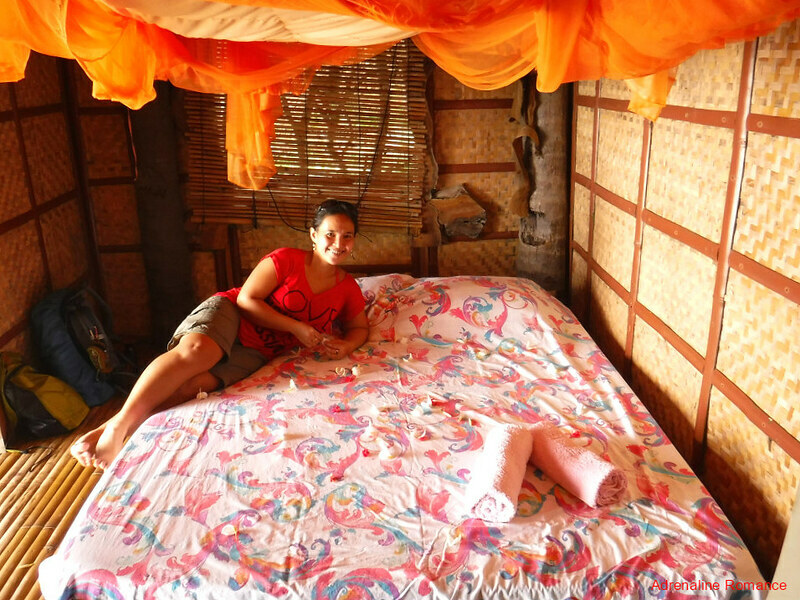 Thus, Ma’am Rowena wants everything in the resort to be as traditional, organic, and natural as possible. 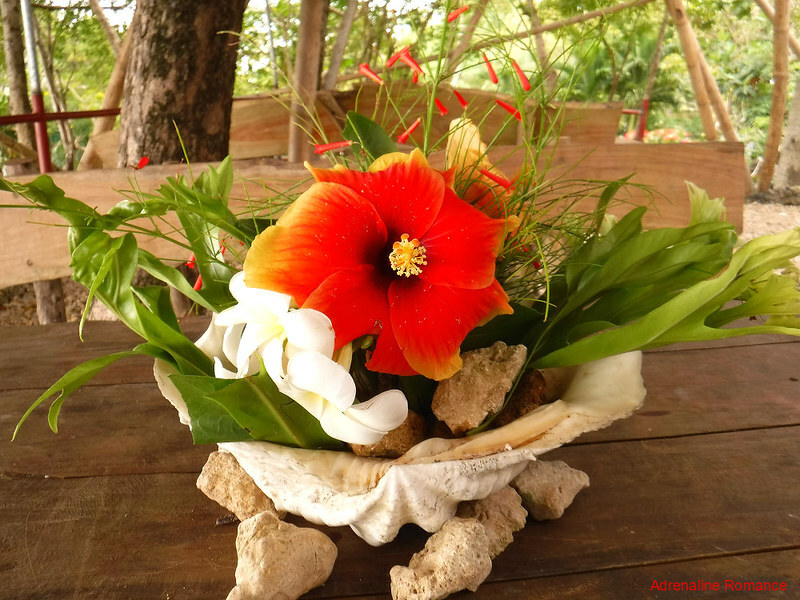 The table centerpiece, for instance, is made of flowers freshly plucked from the garden, stones gathered from from the shore, and a bleached clam shell that was found along the beach. Pretty, isn’t it? No human guard can ever match the keen senses, quick reflexes, and loud bark of Ma’am Rowena’s guardian and best friend Biscuit. The furry toy poodle always stands guard and would not get seduced by other people into rolling over for a belly rub except by his owner. However, he can’t resist barking for a tasty morsel when guests start eating their meals. Hahaha! The boatman who was assigned to take us island hopping had to run a short errand. Since we were not really in a hurry, we decided to explore the resort. 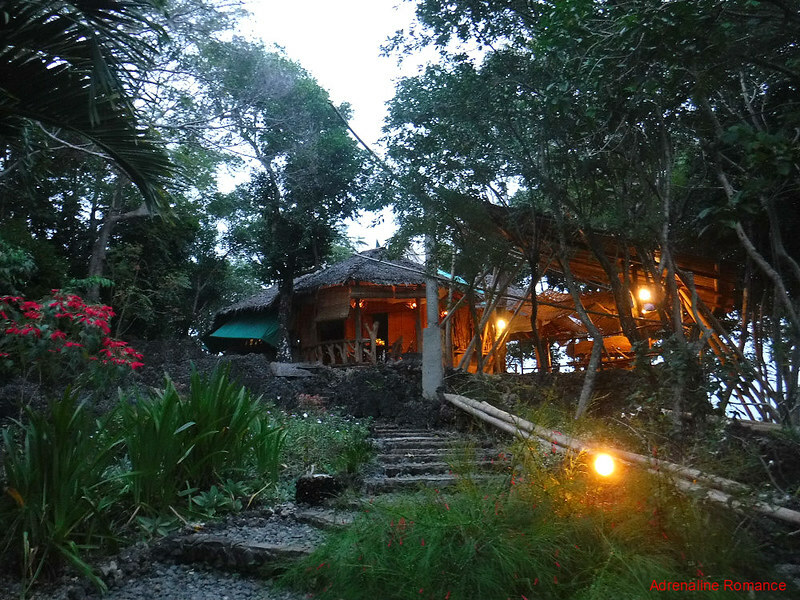 We stayed in the Sunset Cottage, a nice nipa-hut style room that has its own garden and balcony. The architecture blends very well with the natural surroundings. The Sunset Cottage is perfect for couples who love Mother Nature, beautiful surroundings, and simple dates. A queen-sized bed showered with fresh, fragrant petals is the centerpiece of the Sunset Cottage. Don’t you just want to lie down there and relax with your partner in love? A large orange pull-down mosquito net protects occupants from bugs that buzz in the night. The polished bamboo floor and amakan walls allow cool air to permeate, which eliminates the need for an air conditioner. One entire wall of the Sunset Cottage opens to a wonderful view of the green garden, the small beach below, and the blue seascape. There are no artificial structures that are eyesores. Even the toilet looks very natural and organic. Only the sink and the toilet bowl are made of ceramic; the rest of the structure uses Mother Nature’s readily made materials—wood and stone. It’s totally cool, isn’t it? The shower area is as organic as the toilet! The floor consists of smooth stones rather than tiles. 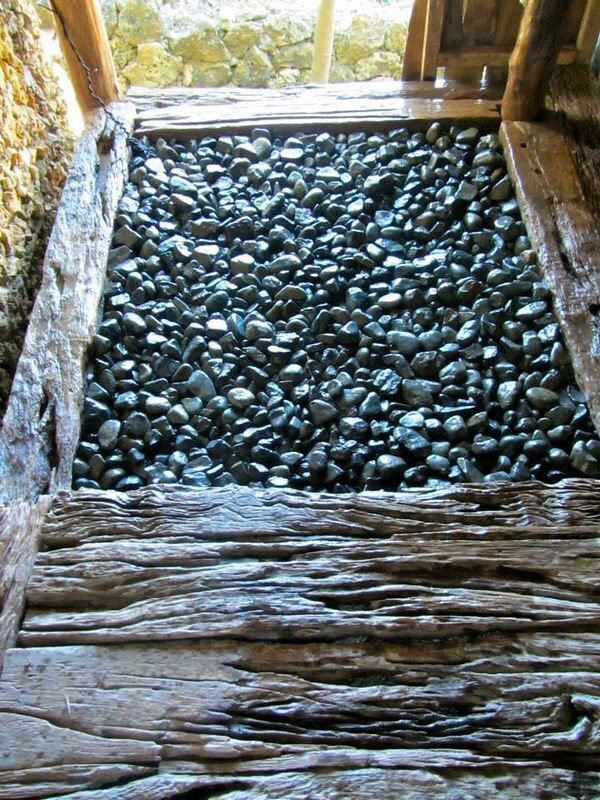 Even the shower head is installed in a hollowed-out driftwood; the stubs act as convenient hangers for towels and wet clothes. But you know what’s the most interesting thing about this bathroom and all other bathrooms in the different types of accommodations in the resort? We’ll tell you in a little while. Above us is the Shell Cottage, a larger version of the Sunset Cottage. It is perfect for families, double-dates, or a small group of friends. The cottage does not face the sea, but it is surrounded on all sides by a dense garden. A terrace and an outdoor living area are cool places to hang out, gaze at the stars, and listen to the sounds of the sea while enjoying the company of each other. 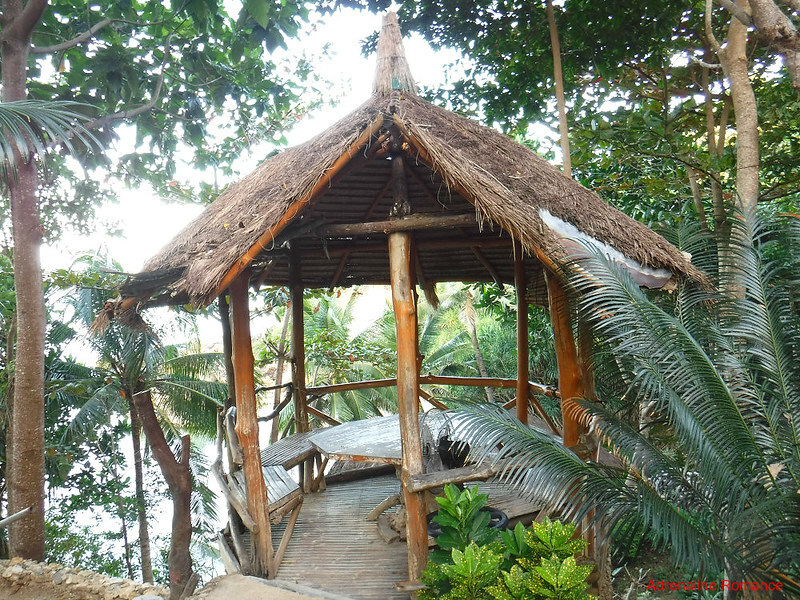 Across the Shell Cottage is this small bamboo-and-nipa gazebo overlooking the resort’s beach. 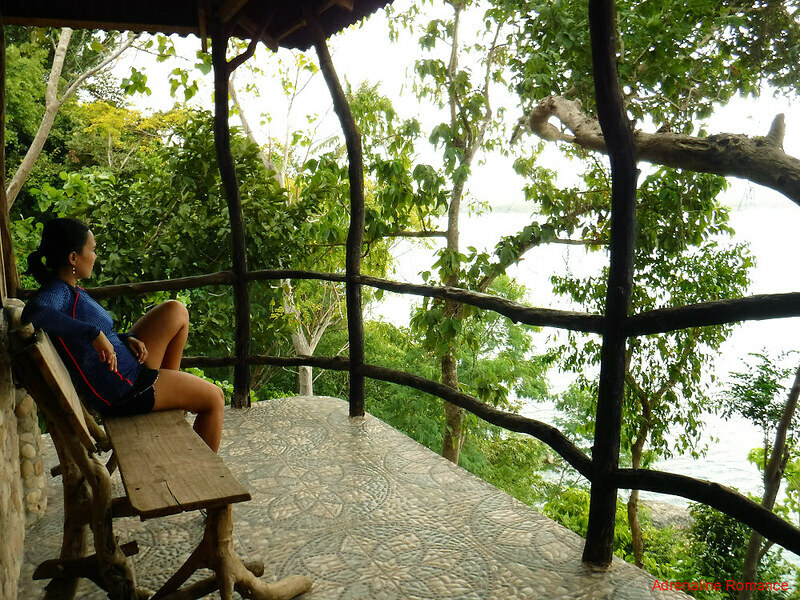 For those booking in the Shell Cottage who want to have a glimpse of the sea, then this is the place to hang out. A set of stone steps leads up to the Cliff Cottage, a structure that hangs precariously at the highest point of the resort. For couples who want utmost privacy with a complete 360-degree view of the surrounding majesty, then the Cliff Cottage is the best choice. Let’s check it out. The open-air balcony of the Cliff Cottage offers the best view in the resort. Spend a lovely evening here with your sweetheart, drinking red wine and whispering sweet nothings. Note: For safety purposes, the resort discourages bringing small children. But if you are bringing a small tot with you, always keep an eye on him. Make sure he does not crawl below or beyond that fence. Remember, out here, it’s a long way down. 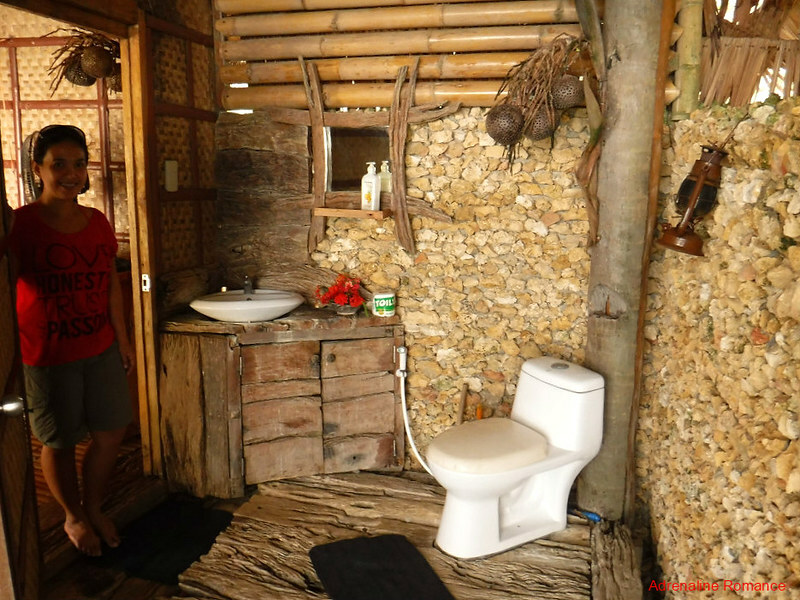 We did tell you something interesting about Nature’s Eye Resort’s bathrooms, right? Well, aside from being natural and organic, they are constructed in open air! Yes, you take a refreshing shower with beautiful vistas of the sea, mountains, and trees as your walls. Oh, don’t concern yourself about being seen with intruding eyes of fishermen and island-hopping tourists plying the waters below. The baths are cunningly constructed so that its occupant can’t be seen from below. So take off all those constricting clothes, and show the world your glorious gifts without a care in the world! We tried, and we tell you: we never felt so free in our lives! Some guests prefer more contemporary accommodations and amenities. Thus, Ma’am Rowena decided to construct a concrete Ocean View cottage. 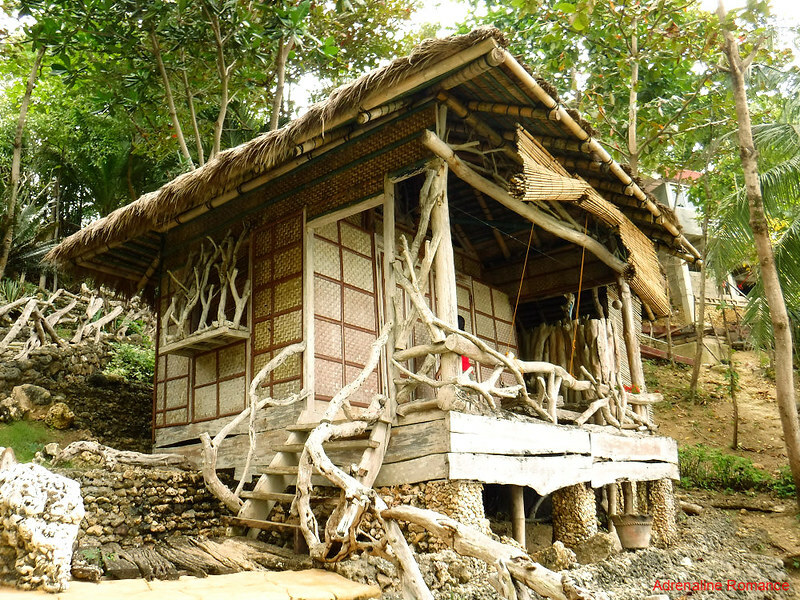 However, to keep it in line with the Filipino look of the other cottages, she used tiles with amakan patterns, wooden moldings, and traditional Filipino accents. The rooms in this type of cottage are expected to be ready sometime March 2017. 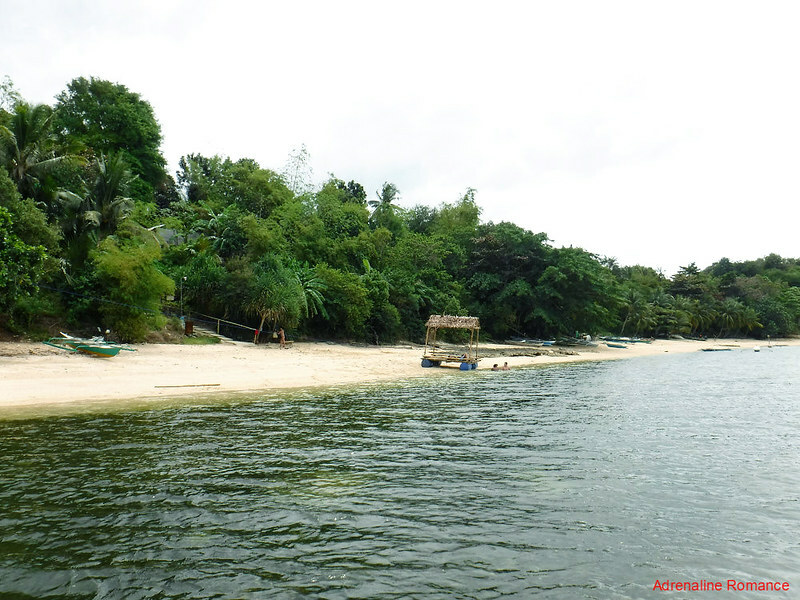 We had a nice island hopping adventure, which we will describe in detail in the next post. We showered, changed into dry clothes, and relaxed in our cottage while waiting for dinner. The overcast afternoon was powerless to conceal the beauty of the day’s sunset. Like the bright eye of some gigantic god, the fiery sun slipped slowly into the sea, its orange rays casting silhouettes of everything around us. 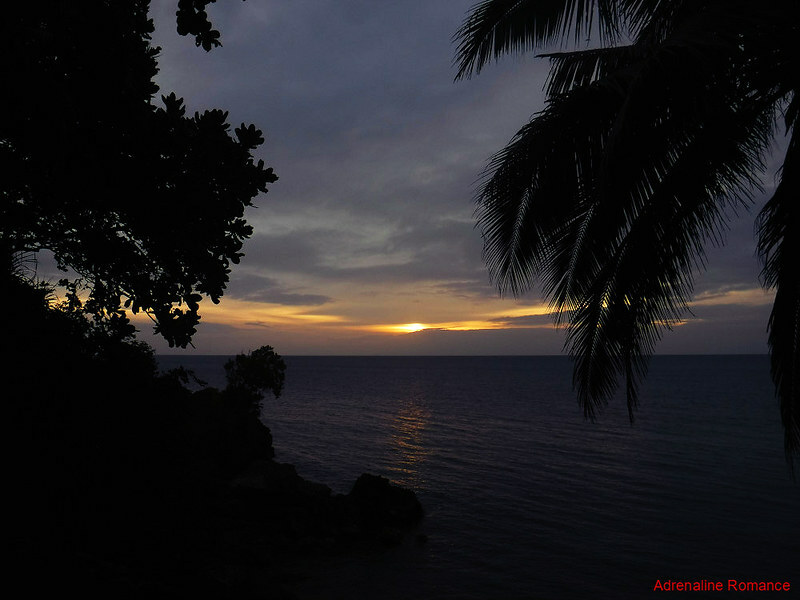 Sweetie called it a very Filipino sunset, referring to some of the country’s best sunset photos featured in postcards. Looking at a stunning sunset in a humble room that faces the vast ocean while cuddling with the love of your life. What could be more romantic than that? While there was still a bit of light in the sky, we headed back to the reception area so we can enjoy a delicious dinner of sweet-and-sour fish. 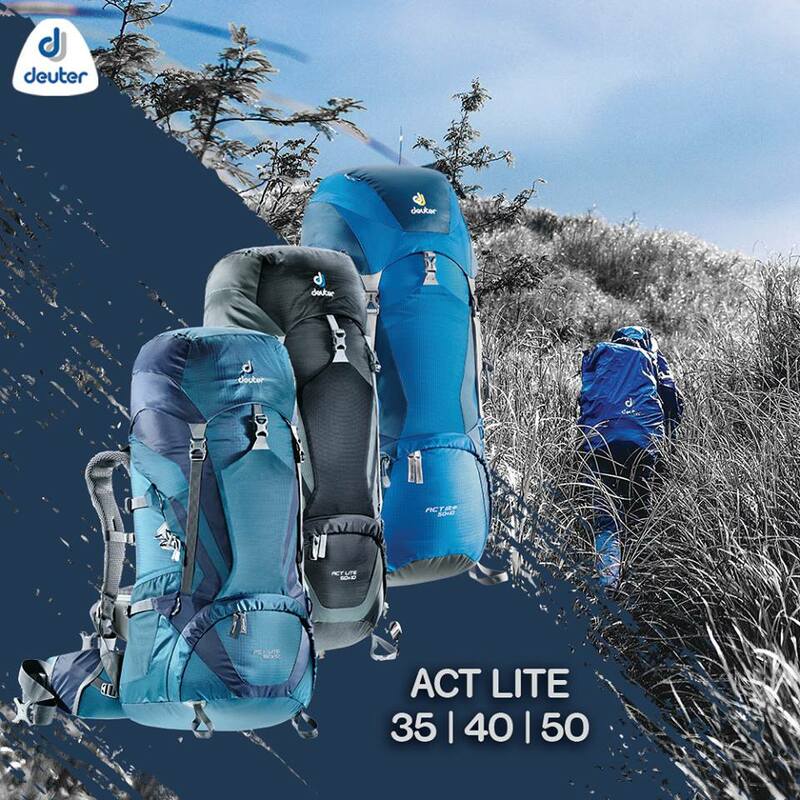 Lights ensure that you won’t trip in the darkness. We spent the rest of the night chatting with Ma’am Rowena, sharing some of our life stories. We slept soundly in our Sunset Cottage, without a care in the world except for the thought about how much Sweetie and I love each other. Our love, accompanied by the song of crashing waves, lulled us to sleep. We woke up early to a nearly cloudless day. Darn, we should have taken our island hopping tour that day when the skies were clear and blue. We showered, dressed, and packed up so we can check out early. We were quite excited for our Guimaras inland tour, and our driver Bong said he will be picking us up at 8 AM. While waiting for breakfast, we checked out the marvelous rock formations that adorned the beach below. They were once ancient corals that were calcified over time. Coral stones like these were used as construction materials—notably bricks, slabs, and foundations of Spanish-era churches, forts, watchtowers, and other buildings. Concrete was not yet invited at that time, so the coral stone pieces were held together by mortar made of mud, egg whites, hay, and other materials. As we went up the stairs, one of the workers intercepted us and remarked that there is another beautiful spot at the east side of the island. Since it was still early morning, the rising sun will definitely casts its soft glow there. And what an awesome sight it was! 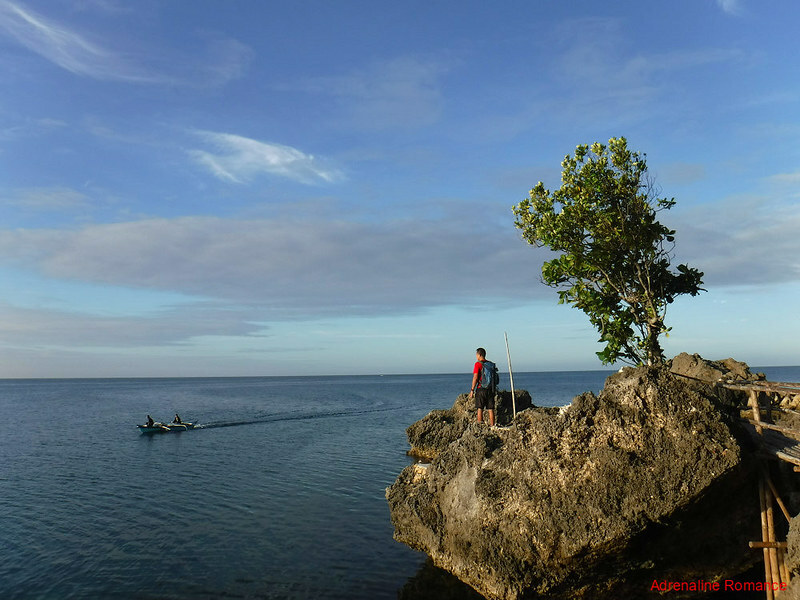 Admiring the seascape of Panay Gulf, we were again awed and humbled by the grandiose beauty of Mother Nature. Certainly, her spirit encompasses our puny notion of human entitlement and earthly position. We had a hot and filling breakfast of garlic rice, garlic-tomato-onion omelet, and fried fish; we need a big meal to nourish ourselves for a rigorous day trip around the island. After saying our farewell to Ma’am Rowena (and promising to come back again; we fell in love with the resort), our chef guided us through a short path that led to the jump-off where Bong was waiting. The scenery looked eerily similar to the protected area that we passed by during our descent from Mt. Km 28 in Camp 8, Cebu. Romance. Passion. Tenderness. Here is a place where beauty, nature, great service, and quiet ambiance embrace you in loving arms. The feeling of love is truly amplified in Nature’s Eye Resort. At last, here is a paradise made just for the two of you. 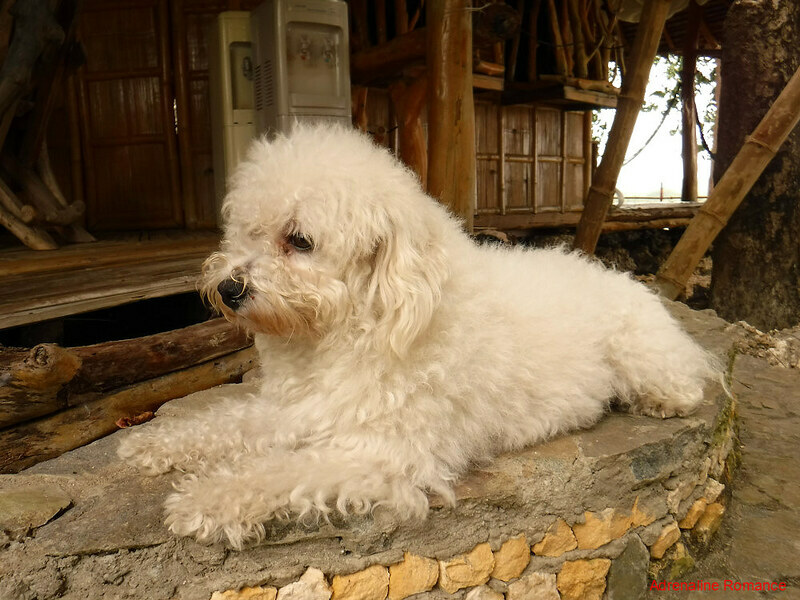 The resort is pet friendly since Ma’am Rowena is a pet lover herself. Ma’am Rowena wishes to maintain Nature’s Eye Resort as a serene, romantic place where couples can relax, enjoy, and celebrate their love. As such, the number of guests in the resort is strictly limited. Thus, a reservation is necessary. Please book and confirm a reservation before proceeding to the resort; walk-ins are virtually not accepted. Ma’am Rowena wants guests to have a great time in the resort. She offers all-inclusive packages to take out the inconvenience so you could just relax and enjoy your stay. We strongly recommend getting a package so you can forget about the hassles. You can also book the following cottages through AirBnB. However, note that these cover the rooms only and not the other inclusions. Detailed descriptions of each type of cottage are included here. If you want a customized service (e.g. just the room and not the other services), please contact Ms. Rowena. Rates are subject to change without prior notice. Option 3: Rent a tricycle, van, or mulitcab to take you directly to Nature’s Eye Resort. 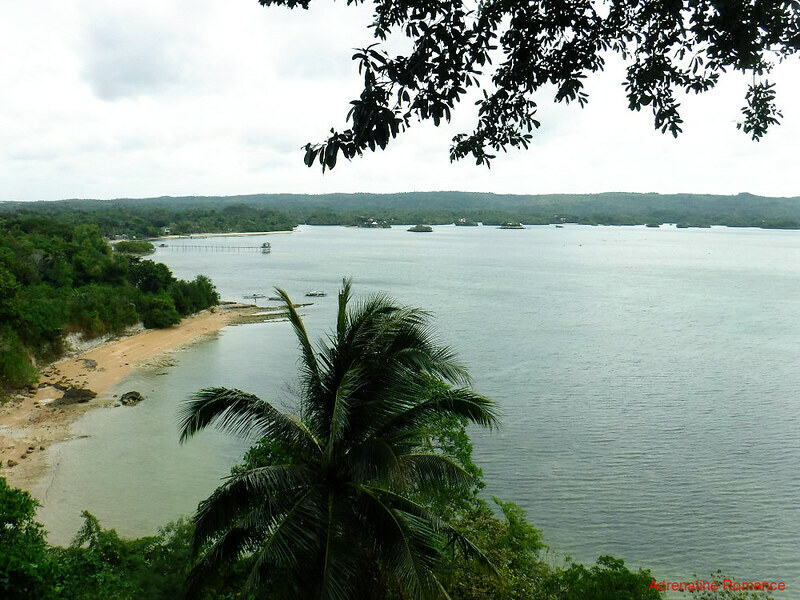 Check the Guimaras Tourism Office for tariff rates. 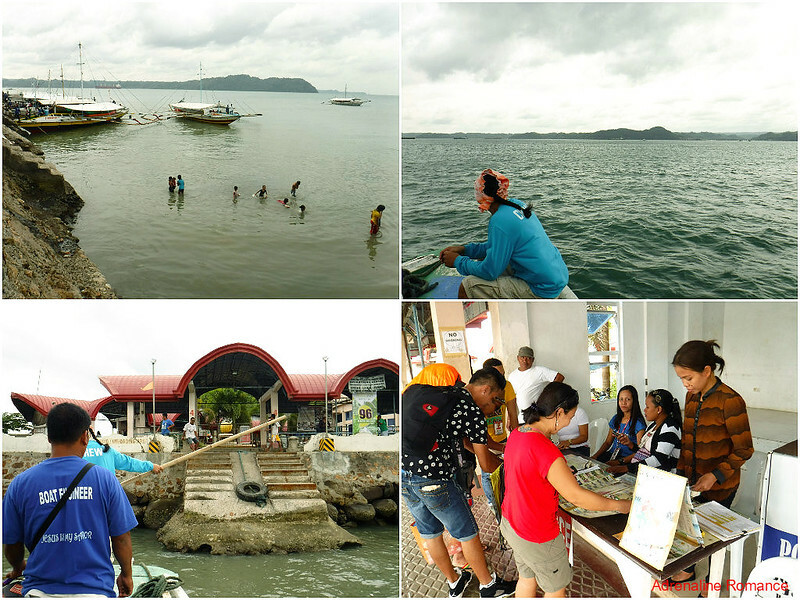 Option 4: At the Ortiz Wharf in Iloilo City, rent a boat that goes directly to Nature’s Eye Beachfront. Rental fee is estimated to be P4,000 per boat. Such boats can accommodate up to 10 passengers. I love that the resort is extremely secluded from civilization. It reminds me of our trip to a small island in Thailand where everything is completely in tune with nature. Same here. We love the seclusion of the resort; you have the entire place to yourself. The service is very personalized, and you feel truly at ease. We had a truly great time. 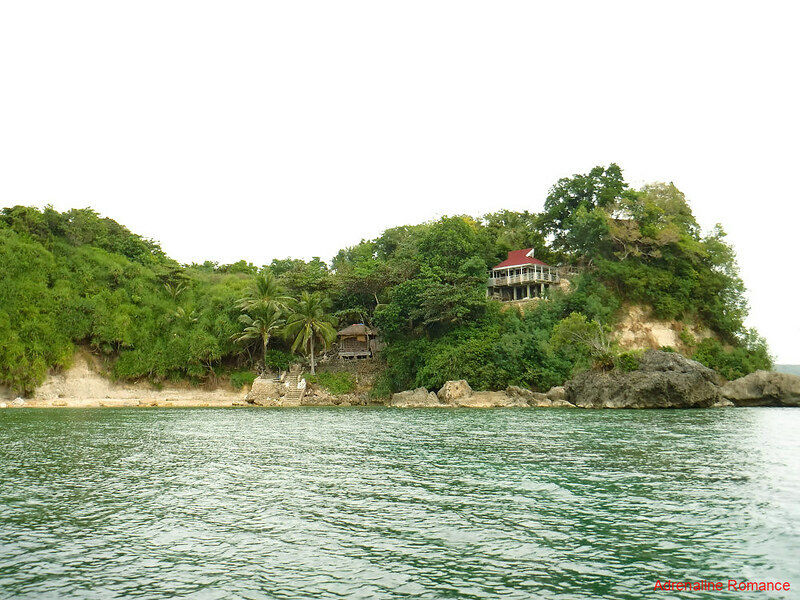 If you plan to visit Guimaras with your sweetie, please book here. Whoa! What a cool resort! It looks so exotic! Plus the people seem so friendly. Great photos! Indeed! It is very romantic, actually. I love how natural this place is and secluded. I’ve used an outdoor shower before in the Maldives. Nothing like taking a shower at night under the stars. This is absolutely stunning – I love resorts like this that are so rustic yet so relaxing. I would absolutely love to visit this place. I just love, love, love the rustic design! I also really like that it’s secluded and on top of a cliff. I would definitely stay here! Indeed! The design actually blends with nature. It looks so natural here, so untouched and lovely. Really great for romantic getaway. This place is absolutely beautiful. Thanks for sharing this inspirational post. The travel tips were also great. I love the natural beauty of the environment, will certainly be looking into more information on this beautiful island. Thank you! 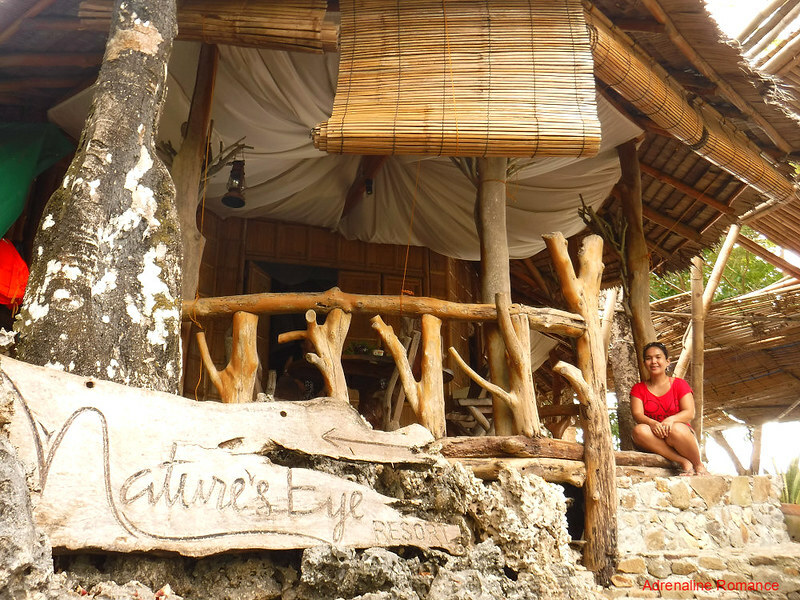 Please do visit Nature’s Eye Resort if you have the chance to visit Guimaras Island in the Philippines. What a beautiful resort, I love how it is secluded away from prying eyes! A shower in the outdoors would be lovely it’s a clever design to make sure you’re not seen. Those flowers are beautiful too, and the display in the shell is gorgeous! The place looks lovely. Beautiful nature. The accommodations, simple and cozy. And I absolutely loved the flowers! Yes, indeed. The nice thing is that the resort offers packages and not just room accommodations. Thus, you will have a hassle-free Valentines, anniversary, date night, etc. By far, you had the more romantic Valentine’s Day. My fiancee was working late so we stayed in and ordered take-out. 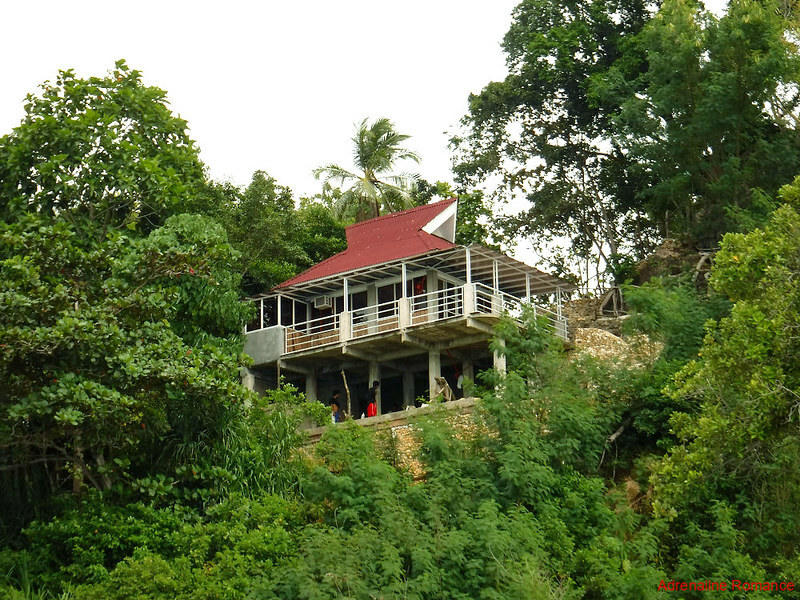 The Nature’s Eye Resort looks really nice; the amenities looks comfortable and very secluded with the environment. The island looks really beautiful and pristine! 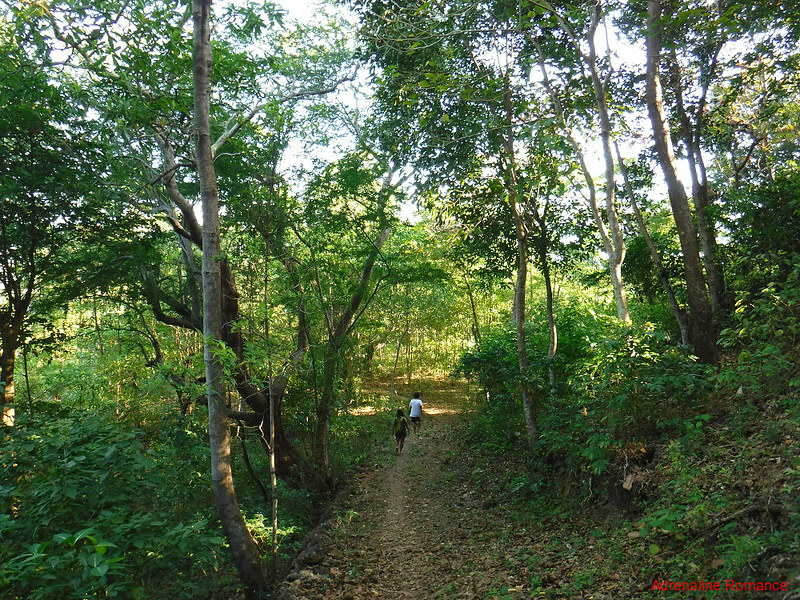 Love the greenery of the forest and the vibrant colors of the flora. The waters and views are spectacular! Absolutely perfect for a secluded vacation for any occasion. Hehe! We always see to it that on special days, we do something special. Nature’s Eye Resort is truly amazing and perfect for couples who want to celebrate their love. I love how green it is here! So lush and beautiful!! Those little cottages look so wonderful. I would love to visit some place like this!